A common reaction to the case for open borders is: that’s well and good, but immigration controls were established for good reason. Every country has them after all. Sure, the practical benefits of open borders look good, and there are plenty of ethical reasons why we shouldn’t close the door on foreigners. But why did our ancestors choose to do so then? Wouldn’t it be unwise to tear down the walls they erected without first ensuring their rationales don’t still apply today? This kind of political reasoning is sometimes labeled Burkean conservatism. Edmund Burke, an Irishman who migrated to England, is often regarded as the founder of modern Western conservatism. Contrary to what the conservative label may suggest, he was no opponent of change; in criticising the French Revolution, he wrote: “A state without the means of some change is without the means of its conservation.” Burke merely preferred a bias in the political process against change: you shouldn’t change things without a really really good reason. I don’t think of myself as a political conservative, but this seems like a fairly reasonable principle. So before we tear down the walls our governments have erected, we should ask why these walls went up in the first place. This is not a question that is new to us, mind you; we first discussed it on this blog two years ago. The answer to Chesterton’s question depends, of course, on which country you’re a citizen of. In my case, as a citizen of Malaysia and Southeast Asia, we have no tradition of walling up and sealing our borders. Our borders themselves were drawn in part because Napoleon invaded the Netherlands, not because of any organic movement towards fixed borders on our part. The original reason our governments established border controls was because our former colonial masters had set these up. It seemed like just one of those things you do once you’re an independent country. So, where did the idea of border controls and deportations for our colonial masters come from? Well, in the case of Malaysia’s former colonial power, the United Kingdom, the first notable instance of the mass deportation and collective punishment of migrants was when King Edward I expelled all Jews from England. A few were allowed to return for visits on temporary visas, but between 1290 and 1657, all Jews residing in England were actually illegal immigrants. So at least in the case of the UK, border controls were originally rooted in racial and religious bigotry, not any sound policy reason. This is not unusual. The United States, that nation of immigrants, first began to regulate immigration with the Page Act of 1875, a law whose primary objective was to exclude Chinese immigrants. It was followed by the Chinese Exclusion Act of 1882, which doesn’t really need any explanation. Many founding principles of US immigration law were established by the Chinese Exclusion Case — again, the name needs no explanation. The case still stands as good law today, even though scholars dismiss the actual reasoning therein as racist and unsound. Later expansions of US immigration controls explicitly aimed to exclude southern and eastern Europeans, especially those of Jewish descent. The Immigration Restriction Act enabled the government to exclude any person who ‘when asked to do so by an officer fails to write out at dictation and sign in the presence of the officer, a passage of 50 words in length in a European language directed by the officer’. The Dictation Test could be administered to any migrant during the first year of residence. It was initially proposed that the Test would be in English, but it was argued that this could discourage European migration and advantage Japanese people, and Americans of African descent. Instead, any ‘European language’ was specified. Over the years, laws and regulations have been used to restrict or prevent the entry of ‘undesirable’ individuals or groups. Making New Zealand British and keeping the country white were the goals of immigration policy until the early 1970s. People from Britain have been actively recruited, while people perceived as ‘different’ have been kept out. 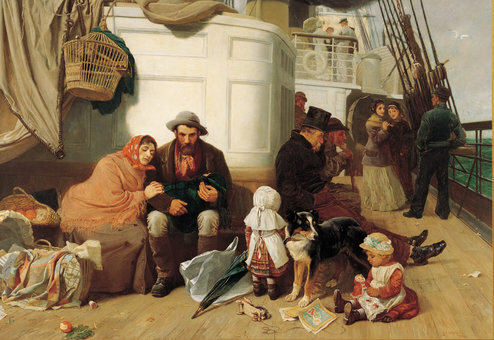 Strong imperial sentiments in the colonial period, and views about race through the 19th and much of the 20th centuries largely explain the purpose of New Zealand’s immigration restrictions. Fellow Commonwealth country Canada on the other hand founded its immigration laws on the principle of promoting open immigration and safeguarding the passage of migrants. Score one for Canadian niceness? Troper points to a series of notorious examples of past discrimination in Canada’s immigration policy: the infamous Chinese head tax; the exclusion of black Oklahoman farmers from coming to Canada in 1910; the refusal in May 1914 of most of the 375 Indians aboard the Komagata Maru after landing in Vancouver, where the ship spent two months before it was ordered back to India; the exclusion of Jewish immigrants from the 1920s until after the Second World War. These and other examples of discrimination paint a picture of a country — not unlike others around the world at the time — that was xenophobic and saw itself as an “Anglo-British outpost of British civility,” Troper says. According to the Canadian Council for Refugees, specific measures taken by immigration officials included: an amendment to the Opium and Narcotic Drug Act to deport “domiciled aliens” with drug-related convictions (directed against the Chinese) in 1922; the prohibition of all Chinese immigrants in 1923; refusal of the ship the St. Louis, carrying 930 Jewish refugees, to land in 1939, forcing it to return to Europe — ultimately sentencing three-quarters of its passengers to death under the Nazi regime. Let us return to my country’s former colonial master, the British. While the first recorded large-scale deportations occurred in 1290, the first recorded immigration legislation was actually the Aliens Act 1793. Prior to 1793, there actually were no legally-required controls or restrictions on foreigners entering the UK. This law imposed a new requirement on foreigners entering Great Britain: they must register their arrival with the government upon entry, and with a local Justice of the Peace. Failure to register would result in jail, pending deportation. What was the reason for this law? The UK government archives today say: “It was introduced to manage the influx of people coming to Britain to escape the French Revolution.” But in reality, it was enacted to exclude French republicans who might have made their way to Britain, mingling among refugees. Fervent opponent of the French Revolution that he was, Edmund Burke favoured this law. Curiously, Burke supported the Aliens Act 1793 even though it stripped foreigners of the right to habeas corpus: the right to challenge your detention in court, an ancient legal tradition rooted in the principle that no government may lock someone up and take away their liberty without just cause. Did Burke ask himself whether he was unthinkingly tearing down Chesterton’s fence? Probably not; this was decades before Chesterton would be born. But one wonders what Burke was thinking. In 1789, Burke wrote: “Whenever a separation is made between liberty and justice, neither, in my opinion, is safe.” If anything counts as an injustice, surely it must be arbitrarily taking away the basic liberties of an entire class of people — not on the basis of any wrongdoing, but simply because of their condition of birth. Oh, but it’s just foreigners being deprived of their liberty, you might say. Except that the Aliens Act 1793 was just the precursor to the Habeas Corpus Suspension Act 1794 — which is exactly what it says on the tin. Now nobody in Britain, citizen or foreigner, enjoyed the safeguards of the ancient writ of habeas corpus. It is of course easy to condemn Burke and his Parliamentary colleagues in retrospect. If we had been in their shoes, facing possible insurrection fomented by, or invasion from, Revolutionary France, we too may have passed the same suspension of habeas corpus. But this incident illustrates an important principle that guides how I think about immigration law: if a circumstance so endangers our state or society that we must restrict basic freedoms, then so be it. But if such a circumstance is only dangerous enough to warrant invading the rights of the peaceful stranger in our land — whilst leaving potential traitors, terrorists, or criminals amongst our own citizenry unaffected — then I am much more skeptical. Either the situation is so dire that everyone’s liberty must be put at risk, or it is simply not that dire. Of course, there are fine gradations in between “that dire” and “not that dire”. And the more dire the situation is, the more justified and less arbitrary some distinctions based on nationality or even ethnicity become: how strongly would one object to Polish controls on German entry in the days leading up to the Nazi invasion of 1939? The problem of justice arises when you assume every scenario our governments face is tantamount to that kind of emergency. At some point, you land on a slippery slope that has you deporting Jewish refugees and throwing your own citizens into prison camps. And while situations like a literal world war may merit restrictions on the movement of foreigners, no sane person can claim we live in such a situation today. When we aren’t at war, and when most of the people seeking entry to our shores are citizens of countries at peace or even allied with us, you can’t simply erect an automatic bar to entry on the basis that governments need extraordinary power to protect us from an invasion that nobody believes is coming. In spite of this, discretionary and arbitrary immigration controls which assume every immigrant poses a dire threat to our society, guilty until proven innocent, are the laws of almost every land today. I submit that such paranoid discriminatory laws are all out of proportion to the risk immigrants pose. Of course anyone can name an immigrant who has done something wrong. You can select any sufficiently large group of people and find all kinds of criminals and wrongdoers amongst them. But the burden of proof rests on the restrictionist to show that arbitrarily excluding most foreigners is in fact a sound and proportionate policy. This is quite Burkean, really: mind you, the alien registration requirement which Burke supported was later repealed after the crisis had passed. A literal Burkean immigration policy would be open borders, with the temporary suspension of habeas corpus in times when invasion or insurrection seemed imminent. The UK’s first immigration controls were only enacted over a century later with the Aliens Act 1905. The roots of this law? Well, it came after the passage of anti-Chinese immigration laws in colonies like Canada and Australia. It explicitly borrowed wording and diction from the United States’s own anti-Chinese immigration statutes. Like Edward I’s Edict of Expulsion in 1290, its primary target was immigrant Jews. The suspension of habeas corpus, limited to times of great danger in Burke’s day, now became an everyday occurrence for any foreigner daring to enter Britain. The revolutionary and radical arbitrary dictatorial power of the government to exclude foreigners at will was now enshrined. Today, it has been so commonplace for the past century to the point that we hardly think of it. So if we think of immigration restrictions as Chesterton’s fence then, how should we characterise the rationale for erecting this fence? If we look at the raw texts of these statutes, we find many references to excluding paupers, the diseased, and the criminal. We can debate the extent to which these exclusions are just, but many of them make some sense on the face of it. But if we look at the intentions of the men (and women, to the extent they were involved) who drew up and bequeathed to us the founding principles of modern immigration restrictions, we find some of the worst and most blatant injustices in the history of mankind. It may of course be true that serendipitously, these laws founded in racism and unempirical prejudice are in fact beneficial and good. But let’s have an open conversation about the benefits of these restrictions then. Let’s place the burden of proof where it belongs: on those who want to prop up those legal walls and fences erected to preserve and entrench bigotry. Posner: What concrete factual arguments do you have against homosexual marriage? Samuelson: Well, we have, uh, the Burkean argument, that it’s reasonable and rational to proceed slowly. Posner: That’s the tradition argument. It’s feeble! Look, they could have trotted out Edmund Burke in the Loving case. What’s the difference? . . . There was a tradition of not allowing black and whites, and, actually, other interracial couples from marrying. It was a tradition. It got swept aside. Why is this tradition better? Samuelson: The tradition is based on experience. And it’s the tradition of western culture. Posner: What experience! It’s based on hate, isn’t it? Posner: You don’t think there’s a history of rather savage discrimination against homosexuals? The only distinction here is that border controls aren’t even a real tradition. The kind of controls on the scale first adopted in the late 19th century and early 20th century didn’t exist in Burke’s day. Massive border controls that arbitrarily restrict human movement purely on the basis of a condition of birth are a modern innovation. And, to borrow Judge Posner’s words, they are an innovation rooted in hate and savage discrimination. 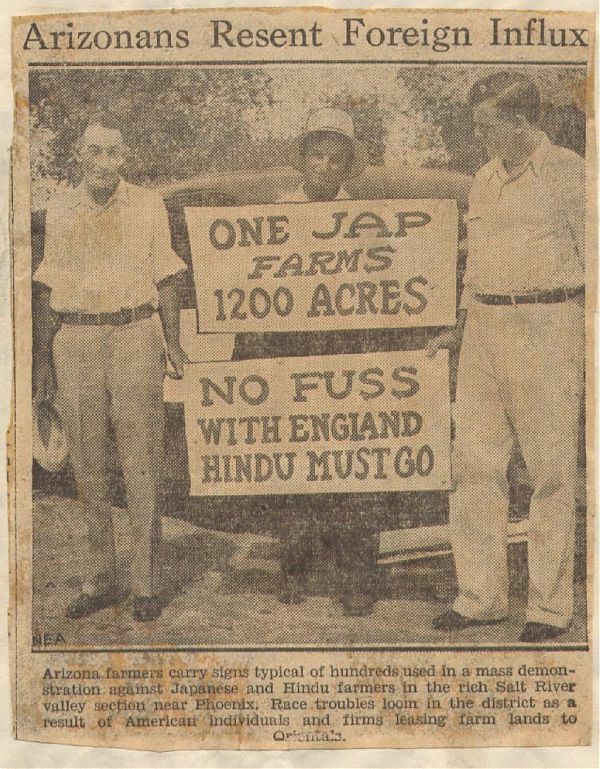 Arizona farmers protest Japanese and Indian farming in the state, 1934. Source: Americana, the E-Journal of American Studies in Hungary. In the name of heaven, we ask, where is your justice? Where your religion? Where your morality? Where your sense of right and wrong? Where your enlightenment? Where your love of liberty? We recognise today the great wrongs that our border controls once visited upon the Chinese, Jewish, or other migrants of the day. But we preserve the same principles of dictatorial discretion and arbitrary discrimination that marked the very exclusionary and unjust laws which victimised these people. There may be good reasons to preserve border controls. But unless you unreservedly embrace prejudice as a sound principle for making policy, Chesterton’s fence is not such a justification. Rather than sound and solid policy, the foundations of our border controls are just rotten cesspools of hatred and bigotry. 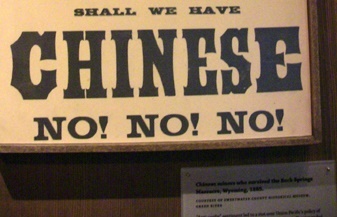 The image featured at the top of this post is of an exhibit from the Museum of Chinese in America, depicting a poster from the late 19th century advocating the exclusion of Chinese immigrants. The photograph of the exhibit is from Robin Lung. April 2015 was the highest traffic month for Open Borders: The Case, even though we had a much smaller number of new posts than usual, and we did not have any special events such as the Open Borders Day we had last month. Our Wedding and Immigration Disaster by Justin Merrill, April 6, 2015, got 151 Facebook engagements and 27 Twitter engagements. It got a lot of traffic from a MetaFilter thread mentioning the post. We spent $10 on Facebook promotion of the post. Open Borders and the Hive Mind Hypothesis by Nathan Smith, April 27, 2015, got 27 Facebook engagements and 6 Twitter engagements. In addition, an earlier post by John Lee, Literally refusing to rescue drowning people: your taxpayer funds at work, putting immigrants to death, January 9, 2015, was promoted on Facebook and posted on Twitter in light of heightened interest in the subject of migrants dying at sea in the wake of the April 2015 Mediterranean Sea migrant shipwrecks. The post now stands at 267 Facebook engagements and 26 Twitter engagements. It also led to Jasmine Coleman, a journalist at the BBC, contacting John Lee for comments on the issue that were published in this article. Our total Facebook spend for the month was $20: $10 on Merrill’s post and $10 on Lee’s old post. Users who come via search (which constitutes about 60% of our traffic) generally go to the site’s background pages rather than blog posts, but there are some blog posts that get a decent amount of search traffic. These have remained fairly constant since January, albeit with a few changes. 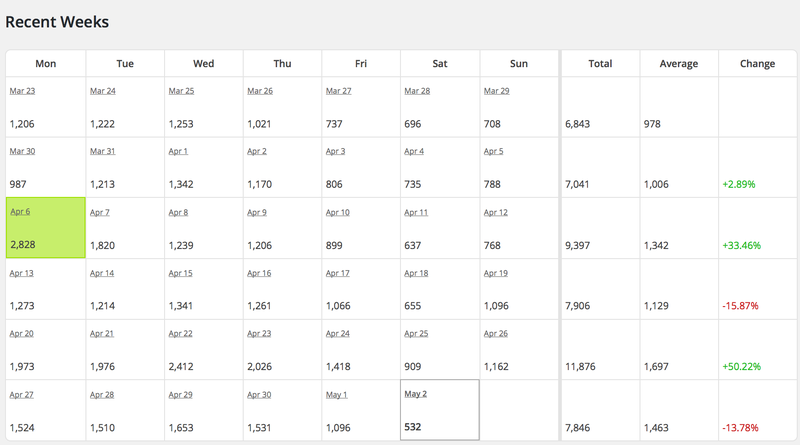 Data below is from Google Analytics, using the integration with Google Webmaster Tools. In the wake of the 2015 Nepal earthquake (that hit the region on Saturday, April 25, 2015), there was a substantial increase in search-driven traffic to Vipul Naik’s blog post Nepal and India: an open borders case study, published March 21, 2014. However, this traffic seemed driven largely by people looking for material on Nepal rather than people specifically interested in open borders, and its engagement with our site was minimal. We therefore did not promote the post on social media. The page was shown in 75,000 Google Search queries and was clicked about 2,500 times (a 3.33% CTR). The blog post Bangladesh and India: move towards open borders by Vipul Naik, January 15, 2015, was shown in 40,000 search queries and got 1,600 clicks (a 4% CTR). The search interest was sustained rather than based on any topical events. The blog post Immigration and the US Constitution by Ilya Somin, March 18, 2013, was shown in 6,500 search queries and was clicked 400 times (a 6.15% CTR). The search interest was sustained rather than based on any topical events. Bleg post by Bryan Caplan, April 27, regarding the economic effects of low-skilled immigration, as requested by a friend who is a Persian Gulf economist. 4 likes, 10 comments. Post by Vipul Naik, April 21, linking to ‘Send them back’: Hillary says wave of illegal immigrant children should be ‘reunited with their families’, June 17, 2014. 1 like, 12 comments. Post by Nathan Smith, April 3, with an updated and near-final draft of his paper on the global economic impact of open borders. 5 likes, 39 comments. The site’s Facebook page reached 4476 likes at the end of April, compared to 4399 at the end of March. The site’s Twitter account reached 1203 followers. The Open Borders Action Group reached 1031 members. April 2015 in review is licensed by Open Borders Admin under a Creative Commons Attribution 3.0 Unported License.